Wake to the sound of the Atlantic ocean pounding below your private sundeck at this superbly situated resort which hugs the craggy rockface a short distance from Cape Town's Clifton beach. Outside, just metres above the surf, a sun-washed leisure deck and pool is the place to relax, enjoy sunset cocktails or to soak in the sun and listen to the waves. Here - built into the giant rocks above the Atlantic surf - is an idyllic setting from which to drink in the beauty of the Cape's natural wonders of mountains and sea. 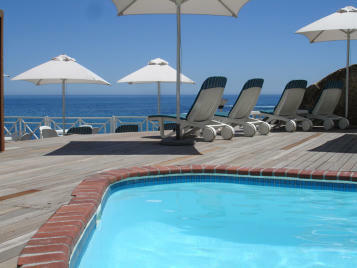 Bantry Bay International Vacation Resort offers fully equipped, self-contained, serviced apartments, varying in size. Choose from studio units (2-4 sleepers), to three-bedroomed duplex apartments (6-8 sleepers), a sumptuously appointed penthouse suite (4 sleeper), and the Neptune suite (4-6 sleeper) with private pool. Revel in the best that the cosmopolitan Cape has to offer outside the luxurious surrounds of your apartment. 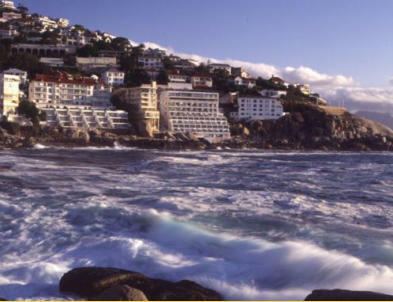 And reflect on how lucky you are, to be staying in Bantry Bay.